The second leg of our Kerala weekend took place aboard a Kettuvalam, or houseboat. 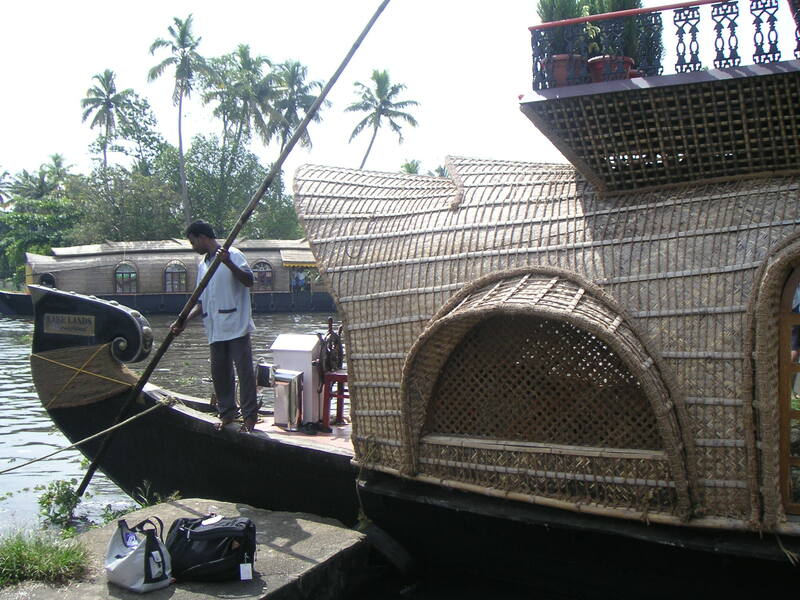 Historically, Kettuvalams were used to transport rice, coir, or other products down the Keralan backwaters. But most of the ones you’ll see these days have been reincarnated as houseboats for tourists. For the most part, the Kettuvalams are welcomed by the locals, as they are somewhat eco-friendly (at least those with inboard (rather than outboard) motors) and they help to add money to Kerala’s growing tourism coffers. On the other hand, their presence ? and, more importantly, their passengers’ presence ? creates an unspoken tension between the haves and have-nots. In such situations, it’s hard not to feel guilty. Both guilt and awe came from the scenery that passed us by as we sat in amazingly ergonomic cane chairs on the upper deck of our boat. We boarded right at the resort, so our first sight was of the red-tiled bungalows receding in the distance. Then, it was just inky water and coconut palms. We were also able to get a better view of the long-neck ducks that had been migrating to the area. Those ducks were divers, and their heads looked pretty serpent-like when they bobbed on the water waiting for bugs or minnows. Unlike Maharashtra, Kerala is currently going through its second monsoon, which isn’t as bad as it sounds. In fact, it was a relief when it started sprinkling about halfway through the afternoon as we sailed down Vembanad. The rain was light and quick, but enough to cause a rainbow. I scrambled to take a picture of it, but the wonderment of it all didn’t seem to translate digitally. I also failed to bring my video camera on the trip, as I’m still awaiting shipment of some of its components. But, I’m sure that had I shot the entire backwater journey from beginning to end, I wouldn’t have been able to capture what we saw, felt, or heard. Little villages, which consisted mostly of small, stone houses belonging to the tenders of the rice fields, lined both sides of the lake. As we went through some of the closer water passages, we were able to get close-ups of villagers doing laundry: dunking their saris, dhotis, and lunghis in the water, wringing them out, beating them on a rock, and repeating. Men rowed their dugout canoes below us, while other men took turns diving to the lake bottom to pull up shells that would be bleached and pulverized to make lime. Children in school uniforms (Indian kids attend school on Saturdays, too) stood by the lake and waved at us and the other boats as we passed. Their parents were mostly indifferent. And, while it was still light enough to see but just dark enough to conceal, we were able to spot many villagers going for their evening bath in the lake. That was humbling. We stopped twice during our overnight backwater trip. The first time gave us an opportunity to stretch our legs. It also gave Anthony a chance to try fishing; but, it was too early, so the big fish weren’t interested. The second stop happened right about dusk, and, along with at least three or four other boats, we docked for the night in the darkest place we could possibly find. 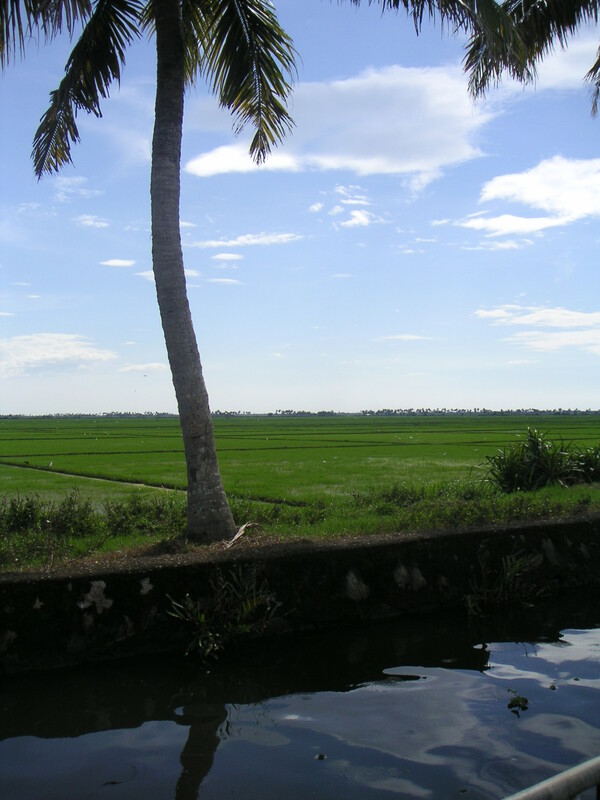 Actually, there was very little in the way of light pollution, especially near the vast expanses of the rice paddies. All manner of critters came alive as night fell in the paddies, and I couldn’t tell if I was listening to bullfrogs, crickets, chirping birds, howling bats, or chattering monkeys. We actually didn’t see any monkeys while in Kerala, but I was hopeful that there was some sort of mysterious night monkey that lurked in the darkness. We could also hear some children singing at the temple across the water; occasional sermons from the church further down the river; and, for a little while at least, a goat bleating in the night. The mosquitoes were terrible, though, so we holed up inside the boat for the rest of the night. By the time we got up the next morning, there was only about an hour left in our trip. We were to disembark at Aleppey (aka, Allapuzzha) by 10 a.m., so our boat crew of three got down to the business of finishing up their stint of service. We were given the comment book to sign, and ? Cool! ? we discovered that India Hicks and her beau had been on the exact same boat just before we were. For Vogue readers, that’s the India Hicks of Ralph Lauren spokesmodel fame, and for history buffs, Ms. Hicks is the granddaughter of Lord Mountbatten, former viceroy of India. Talk about traveling in illustrious footsteps! No matter, the trip would have been well worth it, with or without Ms. India’s validation. This is cool I will forward this to all my friends travelling to India and surely a link to your blogs. For how long are you here in India. And do you have any plans to come to Northern India. It will be interesting to read your experiances about North.